This huge mixed-use, twin-towered project opened in early 2004 after years of controversy. The project replaced the former New York Coliseum. The complex consists of retail space, offices including the headquarters of Time Warner, a jazz facility for the nearby Lincoln Center for the Performing Arts, a Mandarin Oriental hotel, CNN TV studios and 225 condominium apartments. It was developed by The Related Companies, Apollo Real Estate Advisors and the Palladium Company and designed by David Childs of Skidmore, Owings & Merrill. 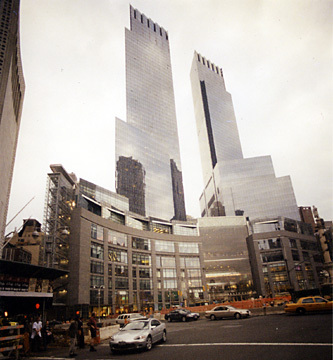 For a while the project was known as the AOL-Time-Warner Center but that company eventually dropped "AOL" out of its name. 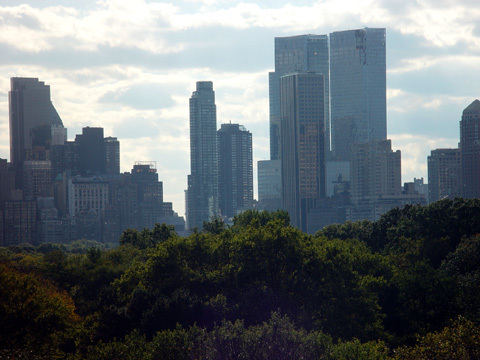 The development of this major site at the southwestern corner of Central Park and the western end of Central Park South after the decision to erect a new convention center for the city near the Hudson River at 35th Street resulted in a very heated and protracted controversy. The developers took on the project after protests by numerous civic groups over the environmental impact of the previous plan for the site by Boston Properties led to a reopening of the bidding process for the site's development. 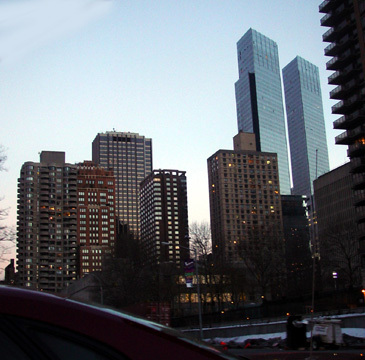 One of the issues was the length of shadows that the skyscraper project would cast on Central Park. Boston Properties had bought the site from the Metropolitan Transportation Authority for $455 million and originally commissioned a rakishly angled project with two towers, one 68 stories and the other 58, that were designed by Moishe Safdie. Boston Properties, headed by Mortimer Zuckerman, had Salomon Brothers, an investment concern, as its partner and also planned to include apartments and a shopping mall. 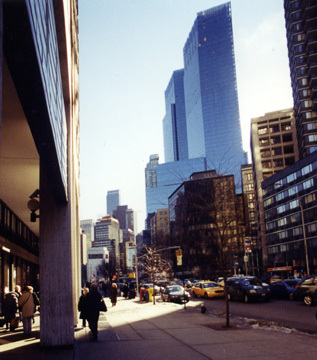 In his fine book, "Upper West Side Story, a History and Guide," Abbeville Press, 1989, Peter Salwen recalled that "Architecture critic (and Central Park West resident) Paul Goldberger called Safdie's design 'a grotesque intrusion' and accused the city of selling its architectural birthright for a mess of pottage." "The Municipal Art Society, ordinarily the most mild-mannered of civic groups, sent out a letter signed by Goldberger's neighbor, TV pundit Bill Moyers. It started, 'Dear New Yorker: I got mad the other day' - and went on to tell how 'a rich developer from out of town and one of the wealthiest companies in the city' had conspired with City Hall to 'gang up' on Central Park....With supporters ranging from Jacqueline Onassis to Lauren Bacall, Christopher Reeve, and James Stewart Polshek, dean of Columbia's architecture school, the M.A.S. then sued to invalidate Zuckerman's purchase of the city, alleging that the environmental review process had been glossed over....A few months later Salomon Brothers pulled out of the project. The price of the land dropped to a mere $357 million, while Zuckerman quietly replaced Safdie with David Childs of Skidmore, Owings & Merrill, who re-conceived the project as a smaller, stepped cluster of towers, sensitively designed to harmonize with the Circle and with Central Park West's landmark twin-towered buildings." Eventually, the city held a new "competition" for the site and David Childs this time was working for the winning developers. Mr. Childs's new design is about the same size of his last design for Boston Properties but instead of that Post-Modern, Art Deco-style design the plan was "modernized' with glass facades and the massing of the towers was more sharply outlined with less architectural detailing. 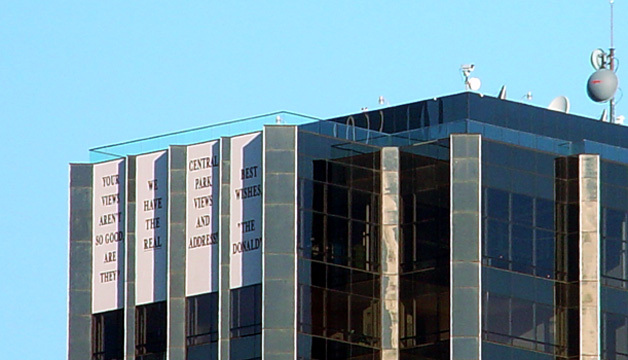 The caps of the twin towers retain a piered look, and while the towers are much lighter in color than the bronze-color recladding by Donald Trump of the former Gulf & Western Building at 1 Central Park West (see The City Review article) just to the north on Columbus Circle, their glossiness is more in context with that structure than with the very rigorous and interesting green-metal clad tower at One Central Park Place one block to the south on the northwest corner of Eighth Avenue and 57th Street that was designed by Davis Brody. (Safdie's more rugged modernism was in more context with the Davis Brody building.) The glossiness also goes fairly well with Sir Norman Foster's notched stainless-steel and glass tower for the Hearst Corporation one block to the south, which was completed in 2006. The best feature of the project is the very spectacular 35th floor lobby of the Mandarin Oriental Hotel, whose entrance is on 60th Street. The luxurious lobby has a lounge with enormous windows overlooking Central Park and Central Park South. It is the best public view in midtown other than the Top of the Rock observatory observatory at 30 Rockefeller Center (see The City Review article) that reopened in 2006. 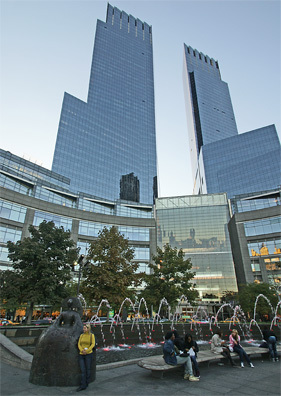 The building's base on Columbus Circle is a four-story retail mall that is spectacular in size and opulently designed around a four-story-high atrium with a large glass wall facing Central Park South. The retail mall has curved alleys with bridges and the top floor is devoted to several luxury restaurants. Atop the retail mall is the jazz facility that also has spectacular windows looking across Central Park South. In the basement of the retail mall is a very large and popular Whole foods supermarket. The towers are setback considerably on the site which extends half way into the long "double" block. There are large, albeit much smaller, residential buildings to the west. A pale imitation of the great high-rise architectural heritage of Central Park West, this very large project is not a masterpiece and would look more at home in a Houston or Dallas suburb. The angled towers are deceptively thin and their facades are studded, which adds a discrete visual interest. In terms of massing, the project is not as interesting as the more rugged One Central Park Place and not as glistening as Philip Johnson's design of the glass facade at the Trump International Hotel on the north side of Columbus Circle and not as picturesque as the former Huntington Hartford Gallery of Art on the south side of the circle whose facade was demolished in 2006 over the protests of many preservationists (see The City Review article) and 240 Central Park south on the east side of the circle (see The City Review article). Nonetheless, this massive project is definitely more attractive than the banal New York Coliseum complex it replaced. Indeed, its completion is notable given the site's controversial history. The controversy over its development was almost as dramatic as that over the redevelopment of 42nd Street, which eventually resulted in the very successful renaissance of the Times Square district. This area, on the other hand, was not in need of new "urban renewal" as that function had been served by the creation several decades before of Lincoln Center. The terrorist attacks of September 11, 2001, however, changed the psyche of the city. "There seems to be no end to the superlatives used to describe the emerging AOL Time Warner complex at Columbus Circle: The biggest construction project in New York City since the World Trade Center. The largest construction loan for a private project in U.S. History. The next Rockefeller Center. When it opens in late summer or fall of 2003, the complex will have five floors of stores and restaurants, 1.1 million square feet of offices, Jazz at Lincoln Center, a hotel, TV studios and more. Perhaps the biggest impact of the project is an unanticipated and symbolic one: Just as the city's two tallest towers have been destroyed, two more that eerily resemble them are slowing rising uptown." While the modernism of this project is uninspired, its presence is hard to ignore and is further proof that the West Side has arrived. Indeed, perhaps the most significant part of the project is its luxury hotel component, which is extremely sumptuous. Its top apartments have fetched very impressive prices, reinforcing New Yorkers' affection for twin towers will continue. There is a lot of traffic here but also excellent public transportation and the project is only a few blocks south of the Lincoln Center for the Performing Arts. There are no balconies and no roof deck, but the hotel has a spa. Despite some quibbles, this is New York's most impressive mixed-use building. It could have been considerably taller as no one seems to care any more about the shadows! It is slick and its public spaces are spacious although one is surprised that more people leaning on the mall's rails don't get vertigo, an indication perhaps that New Yorkers and tourists alike are starved for grandeur. The mall, while it smacks of suburban shopping, is pretty grand. "By the end of World War II Columbus Circle, the Upper West Side's principal gateway, had become the slightly seedy northern terminus of the theater district, home to such theaters as the Cosmopolitan Theater (John Duncan, 1904); Joseph Urban (1923). Postwar activity began with a proposal for a new indoor sports arena in 1946. A 25,000-seat facility intended to supplement Madison Square Garden, the arena was the brainchild of the Garden's president, General John Reed Kilpatrick, and Robert Moses, who proposed it in combination with a 200,000-square-foot exhibition and convention space. Difficulties in obtaining funding authorization in Albany, as well as the growth of television - which cut down the audiences willing to pay to attend sporting events - stalled the project. In December 1952 Robert Moses, in his dual roles as chairman of the Mayor's Committee on Slum Clearance and chairman of the Triborough Bridge and Tunnel Authority, secured federal funds for the redevelopment of two blocks immediately west of Columbus Circle, which were combined to create a site big enough for a major convention and exhibition facility to be known as the Coliseum. The new building would fill the void left in 1951 by the conversion of the Grand Central Palace (Warren & Wetmore, 1911) into an office building. Moses proposed to meet the site-acquisition costs with funds obtained through the new federal Title I program, which was intended to help clear slums and build affordable housing. Because the program required that projects receiving funding must be dominated by residential construction, Moses dedicated more than half the site to residential purposes, although he counted the land used for parking as part of the housing. 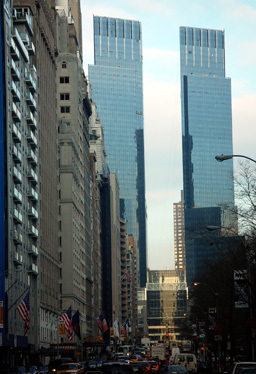 Acquisition costs for the site, bounded by Columbus Circle, Broadway, Columbus Avenue, West Fifty-eighth and West Sixtieth streets, were very high, in fact the highest ever in the nation, six times the average cost of a typical Title I project in New York....The site also brought with it problems of tenant relocation: 243 families lived on the site, along with 362 hotel- and rooming-house occupants. And in addition to the former Cosmopolitan Theater, which was being used by NBC for some of its most popular television programs, the site included the twenty-two-story Gotham National Bank (Sommerfeld & Steckler, 1920). The Coliseum project was challenged in the courts when a pawnbroker named Kaskel sued the city, claiming that the site was not a slum. Despite expert testimony by William C. Vladeck, president of the Citizens' Housing and Planning Council, who claimed that only 10 percent of the tenements were substandard or unsanitary and only 2 percent of the site was a slum, New York State's highest court denied the plaintiff's objections by a vote of 5 to 2. Although Skidmore, Owings & Merrill were at one point rumored to have been selected to design the Coliseum, the job was ultimately awarded to Leon and Lionel Levy, who had been associated with the project since its conception, in consultation with John B. Peterkin, Aymar Embury II and Eggers & Higgins. Preliminary designs called for a fluted, boxlike building that confronted the circle's concavity with a giant convex curve swinging from Fifty-eighth to Sixtieth Street. Joseph Addonizio, of the West of Central Park Association, characterized it as 'oversized salt box'; Albert S. Bard, of the City Club, called the design 'just plain punk.' By May 1954, when construction got under way, the design had evolved into a facility combining a twenty-story, 241-foot-tall, 533,000-square-foot office tower running east-west along Fifty-Eighth Street - a programmatic element not included in the original plan - with a four-story, 273,672-square-foot exhibition hall (half again as big as Grand Central Palace), an 850-car underground garage and two 300-family, red-brick-clad, slab-like apartment houses designed by Sylvan and Robert Bien for the site's western end. The final design not only lacked the auditorium that such facilities usually have but also the 6,000 fixed balcony seats originally planned to overlook the exhibition hall's main floor, which would have helped it better function for the kinds of large meetings that were often key features of business and political conventions. The Coliseum faced Columbus Circle with a 421-foot-long, 106-foot-high windowless wall, which was clad in light gray brick above a dark granite base and adorned only with four eleven-foot-square aluminum medallions, designed by Paul Manship....Not only did the broad, ponderous rectilinear mass disregard the circle's geometry, it also blocked the axis of Fifty-ninth Street, which was demapped through the site. To minimize congestion and compensate for the loss of this street, Fifty-eighth and Sixtieth streets were widened.....The building's design, which Moses characterized as 'conservative modern,' satisfied few observers. Just as construction was about to begin, Art News editor Alfred M. Frankfurter blasted the design....Frankfurter felt the building's design was 'pedestrian' and riddled with 'hybrid pseudo-modern detail. '....Moses was handed a copy of Frankfurter's editorial as he arrived late at the dinner; as the event's principal speaker, he made indirect reference to the attack, telling his audience that public officials had no right to experiment on a big scale. '...The Coliseum opened on April 28, 1956....From the first the Coliseum was a building New Yorkers loved to hate....To many architects the most galling aspect of the Coliseum complex was not its bland and boxlike appearance but its complete disregard for the geometric challenge posed by Columbus Circle....In 1957, John Barrington Bayley, an architect trained in Modernism under Walter Gropius at Harvard but now converted to the cause of a revived Classicism, proposed a scheme that ringed the circle with a colossal portico and enclosed galleries honoring the dead of World War II and the Korean War....Bayley also proposed a new pedestrian plaza for the center, raised above the level of traffic, and a grand Bernini-inspired stairway leading to a new concert hall and opera house, presumably sited at the southwest corner of Eighth Avenue and Fifty-eighth Street....In 1961, the circle was modestly spruced up when Douglas Leigh, the creator of outdoor advertising spectaculars, contributed thirty-six fountains in two tiers to ring the base of the rostral column carrying Gaetano Russo's statue of Columbus. In 1968, the Triborough Bridge and Tunnel Authority proposed to augment the Coliseum complex by bridging Sixtieth Street with an expanded exhibition hall identical to the original and by constructing a new office building on the northwest corner of Broadway and Sixtieth Street, again nearly identical to its original counterpart. Contemplating the TBTA's aerial perspective drawing of the expanded scheme, Ada Louise Huxtable...[declared that] this plan would 'put the final stamp of spoilage on what could have been one of the city's handsomest public spaces, if anyone had cared.' The TBTA's expansion plans did not go forward." The city eventually built a new convention center, the Jacob K. Javits center along the Hudson River north of 35th Street, because the Coliseum was no longer able to attract major conventions and exhibitions because of its small size. In time, the city sought to redevelop the Coliseum site and in the late 1980s invited developers to bid on the site, ushering in a new era of controversy for the site. "In a first round of fantasies," wrote Elliot Willensky and Norval White in their excellent book, "The A.I.A. Guide to New York City Architecture, Fourth Edition," (Three Rivers Press, 2000), "the old Coliseum would have given way to a dual set of enormous towers (Moshe Safdie, architect), a new colossus that threatened to throw an elongated shadow across the lawns of Central Park while exacerbating the traffic volume at this node in the Broadway corridor. Round two was initiated by the pullout of a key tenant and the winning of a lawsuit brought against the City and the Triborough Bridge and Tunnel Authority by the Municipal Art Society and allied groups, who charged double-dealing. The resultant rethinking brought a new round of proposals by myriad developers and architects. The winning scheme has a somewhat milder intensity of development and David Childs of Skidmore, Owings & Merrill is at its helm." 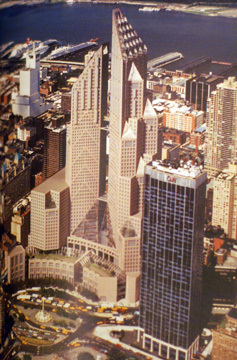 An early design by David Childs called for a twin-towered project that was stylistically similarly, albeit much larger, to some of the great Art Deco-style twin-tower residential skyscrapers of Central Park West. His final design for Time Warner Center was scaled down somewhat and is not as pretty as his earlier design. While the retail component of the Time Warner Center is upscale, if not upper scale, the project's mix of mega-supermarket, super deluxe hotel, expensive restaurants, offices, expensive apartments and a jazz facility is impressive. "At Bustanoby's Domino Room, Broadway and 60th Street, the patronage was half Broadway, half Fifth Avenue. Bustanoby's was declared in bold black and white, a theme carried into the furniture, draperies and even the china, with what one regular called 'a completely equipped turkey-trotting department in a ballroom at the rear of the main restaurant. '....By night, Columbus Circle was brilliant with light. 'On all the surrounding buildings are great electric signs,' reported one habitu�. 'Long rows of steely electric arc-lights disappear in dwindling perspectives far down the intersecting streets. From six directions electric cars - moving clusters of light - dash across the center of the Circle, while from high up, at the top of its tall column, the statue of Columbus looks down, moody and dark.' At Reisenweber's, on the Circle's southern edge, people even went to dance at teatime, in the afternoon. Here was an establishment that spread out and up through three adjoining buildings and astonished with a stream of entertainment novelties. To Reisenweber's came Maurice Mouvet, the sleek, swivel-hipped original of a hundred silent-film gigolos, an international figure (actually born in Brooklyn, though he posed successfully as a romantic Latin) who had introduced the danse des Apaches to Paris and the tango to New York....Reisenweber's was the loudest, if not the gaudiest, of the lobster-palaces....In the vast, red-carpeted dining room - capacity 750 - New York saw its first floor show, complete with dancing girls and a revue staged by Gus Edwards and climaxed by the Five Jansleys, who performed heart-stopping acrobatic feats atop a fifty-foot ladder. The turkey trot, most memorable step of the ragtime era, was introduced in Reisenweber's Hawaiian Room. In the rooftop dance hall, Sophie Tucker, the Red Hot Mama, would look around to see who had come that night, shake hands with the customers at some of the built-in settees, and launch into a program that ranged from the frankly suggestive to the sentimental and mawkishly patriotic....Another high point for Reisenweber's came in January 1917, when cornetist Nick La Rocca opened there with a five-piece group he called The Original Dixieland Jass Band. They were a phenomenal success....Within a month the ODJB recorded 'At the Darktown Strutters' Ball'....On the circle, even the standardized, sanitized Child's Cafeteria had glamor. F. Scott Fitzgerald described it at 4 A.M.: 'Within its pale but sanitary walls one finds a noisy medley of chorus girls, college boys, debutantes, rakes, filles de joie - a not unrepresentiative mixture of the gayest of Broadway, and even of Fifth Avenue.' And when night ended, 'the great plate-glass front turned to a deep creamy blue, the color of a Maxfield Parrish moonlight - a blue that seemed to press close upon the pane as if to crowd its way into the restaurant. Dawn had come up in Columbus Circle, magical, breathless dawn, silhouetting the great statue of the immortal Christopher, and mingling in a curious and uncanny manner with the fading yellow electric light inside.'" Fitzgerald neglected to mention cigarette smoke and in early 2004 Mayor Bloomberg's anti-smoking edicts and reports that noise should not be tolerated late at night suggest that Columbus Circle may never fully regain its raucous past even as it becomes more rarefied. 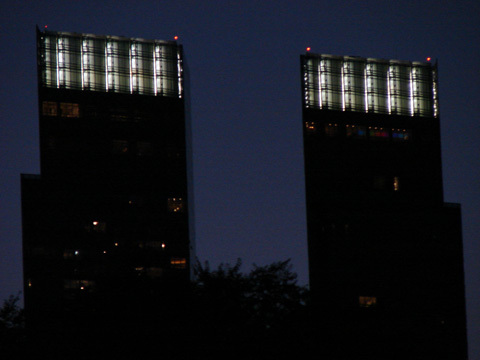 At the end of 2004, lights were turned on atop both the towers. They were several stories high and quite impressive.